2016 is the 400th anniversary of William Shakespeare’s death. Here are 10 reasons Shakespeare is still relevant—and ways to celebrate his work. There are dozens of film adaptations of Shakespeare’s plays. You’ve seen West Side Story (above) and Gnomeo and Juliet. Here are some lesser-known adaptations and inspirations. Go to prison. Caesar Must Die is a dramatized documentary that follows real-life mobsters and murderers in an Italian prison as they prepare a performance of Julius Caesar. Spend the weekend with the Melancholy Dane. Watch Kenneth Branagh’s gorgeous Hamlet—which serves as great homework for Tom Stoppard’s terrific Rosencrantz & Guildenstern Are Dead. Look to the East. One of our favorite filmmakers, Akira Kurosawa, directed two of the best Shakespeare adaptations out there: Throne of Blood (Macbeth) and Ran (King Lear), both set in medieval Japan. Omkara is an unusual adaptation of Othello set among mobsters in northern India, created by the endlessly inventive industry of commercial Hindi cinema—Bollywood. 9. Look to the sky! 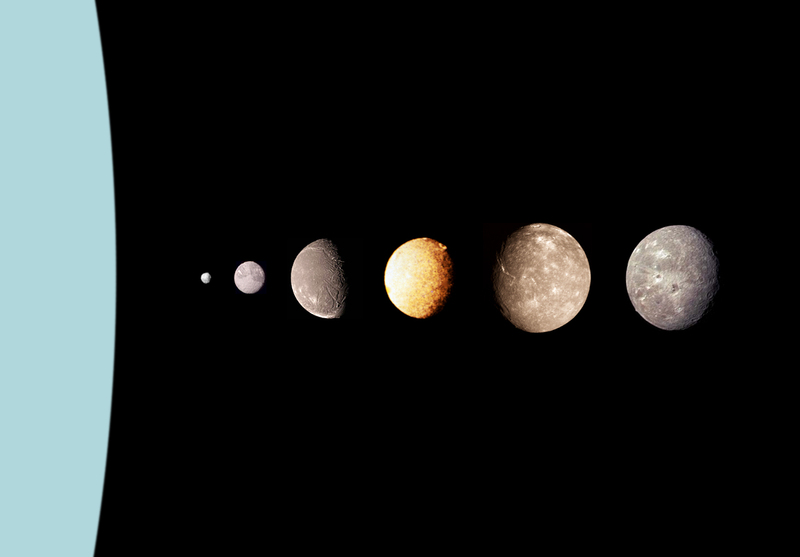 That’s Uranus on the left, and its six largest (and Shakespearean) moons: Puck, Miranda, Ariel, Umbriel, Titania, and Oberon. Image by NASA, of course! Shakespeare didn’t just write plays, he wrote poems. Prepare for National Poetry Month by familiarizing yourself with iambic pentameter. Here’s a great map of Shakespeare’s Britain, and this MapMaker Interactive map will get you started on the plays. Check out the first crop of Shakespeare Solos, The Guardian’s presentation of some of Shakespeare’s greatest speeches performed by some of Britain’s leading actors. “Tongue-tied”? “It’s Greek to me”? “In a pickle”? Nope. You speak Shakespeare every day. Tweet your favorite line to #PlayYourPart. 4. Walk with the Bard! This might be a bit ambitious: “Over the spring weekend of 23 – 24 April 2016, the banks of the Thames will come alive with an extraordinary celebration as Shakespeare’s Globe invites the world to join The Complete Walk. 37 screens along a 2.5 mile route between Westminster and Tower Bridge will play a series of specially-made short films” on the anniversary of Shakespeare’s death. 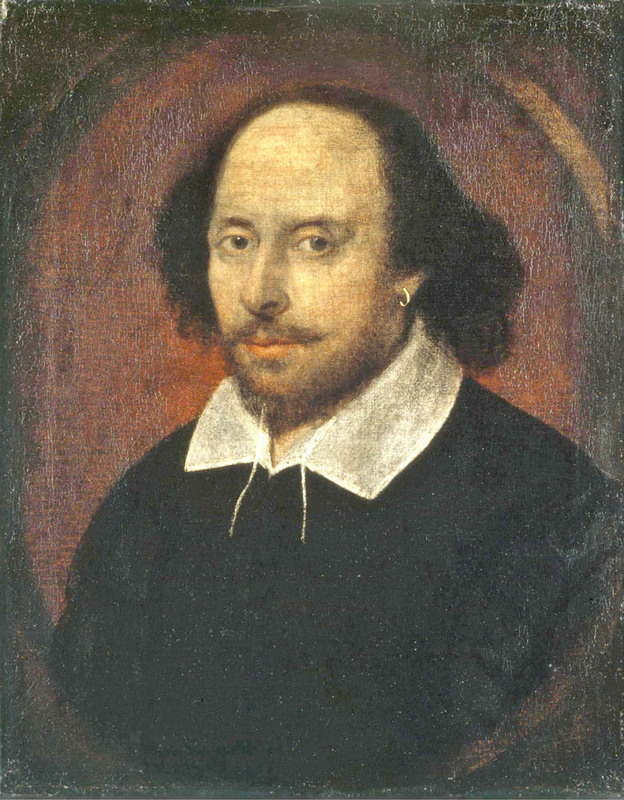 The so-called Chandos portrait, attributed to John Taylor, is the most famous image of William Shakespeare. We think. Painting attributed to John Taylor, courtesy the National Portrait Gallery. Public domain. Who wrote the plays of Shakespeare? Francis Bacon? Edward deVere? William Shakespeare? 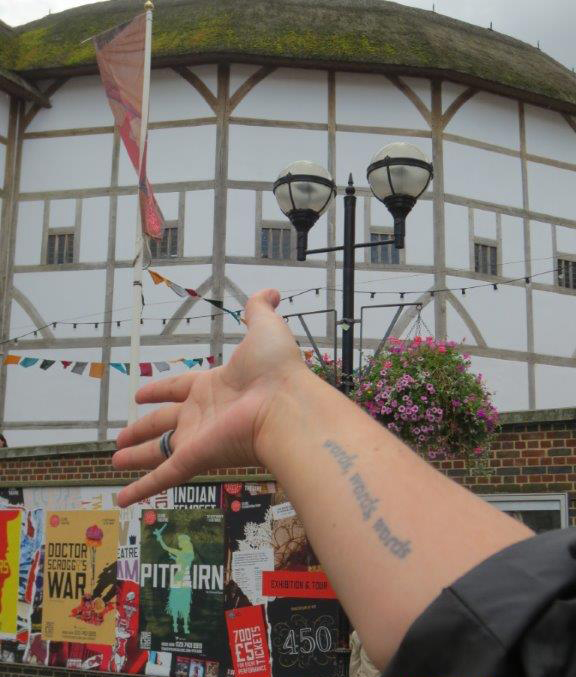 Globe-to-Globe Hamlet is a two-year production taking Shakespeare’s most famous play to every country in the world. Earlier this month, actors performed for an audience of displaced people in the Jungle, a sprawling refugee camp in Calais, France. Keep track of Hamlet here. All the world’s a stage, and nothing will help you understand Shakespeare like participating in a performance. There are dozens of ways to participate—audition for a role, apply stage makeup, design a costume, build a set, create a marketing campaign. Find a theater company near you and see how they need help. Need more? Here are 5 ways to celebrate the Shakespeare Year and here are 6 reasons why he’s still relevant.